Those of you who only know me from following, know that there are a handful of things that I cannot stand! (Those who really know me, know that there are possibly two handfuls). Either way- one of them is cooking and the one right behind that is meal planning. I cringe when I look at the board and there are only two planned meals left. That means I have to start pestering everyone, trying to hit them up for ideas. Preparing myself for the moaning, bitching, and complaining that comes with telling everyone what the plan is. "Ew, only she likes that!" "Aw, man! Didn't we have that like a week ago?" "Why don't we ever have what I like?" It's a lie. Everyone eats it. All of our weeks run together, so yes, you've had this before. And finally, because we can't have skittles and Mountain Dew for dinner. Every week. Without fail. I plan. I shop. I cook. I reheat. I cook again. Every week. When they wake up, they ask "what's for dinner?" When they get off the bus, "what's for dinner?" WHILE we are AT the dinner table, "What's for dinner TOMORROW?" Aghhhhh!!! It's a never ending cycle!! But I think I have found some help. Some beautiful-bathed-in-the lights-of-heaven, angels-singing-on-high-kind-of-help! (And you may already know about this. I could be late to the party- probably because I was in the freakin kitchen! But I'm going to tell you about it anyway! 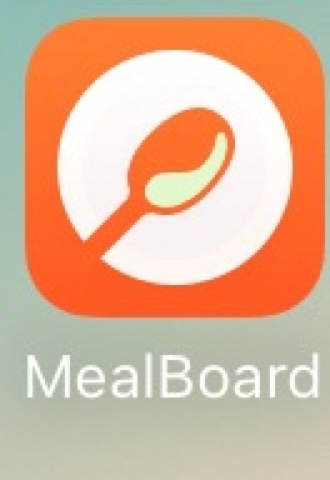 It's an app called MealBoard. It's not free. It actually cost $3.99. I normally don't buy apps without having heard someone gush over them- but I was desperate and the description looked promising. So I splurged. I have talked to everyone in the house about it! They are sick of hearing it. I don't care, I'm the oldest- they have to listen to what I say. Boom. There's just so much goodness in here!! 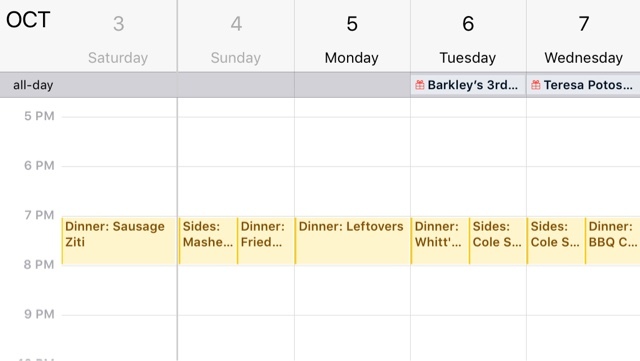 I started writing what we had for dinner on our calendar back in mid September. Just so we could try and stay out of the "dinner rut". I am so glad that I did! 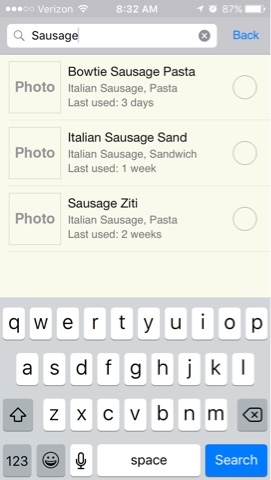 Because you can go backward on this app and add what you cooked on any day. You can even choose breakfast, lunch dinner- side, appetizer, dessert. My main concern is dinner- the main dish and sides. I just click the calendar, select when I want to start adding in recipes. And then click the + next to the day to start adding. AND LOOK! It tells me the last time I cooked it!! So no one can say "we had that last week!" (Except for the Italian Sausage Sandwich because we totally had that last week). Y'all, there's more. 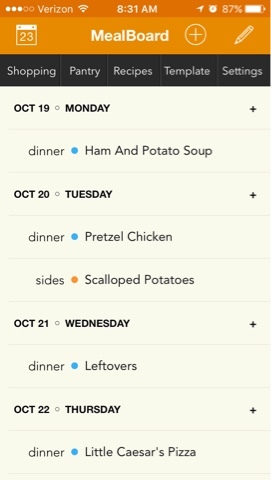 Now that I have 6 weeks of meals in here, I can go to anyone of these weeks and then choose "Save Meal Plan as Template" and it will place that WHOLE week for the coming one!! That's the whole week planned! All I have to do is make a list for the items I need - I don't have to ask anyone for anything!! (Can you hear the hallelujahs)? 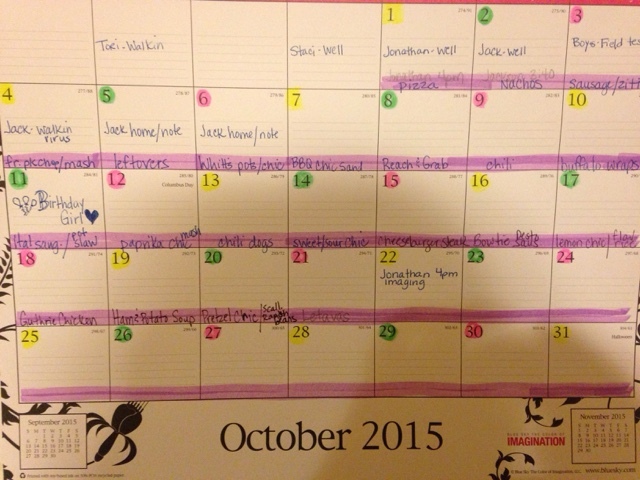 I'll probably wait for a month or so before I start copying whole weeks- but you can bet I will!!! I can even export it to an iCal that we share ! You can also import recipes! 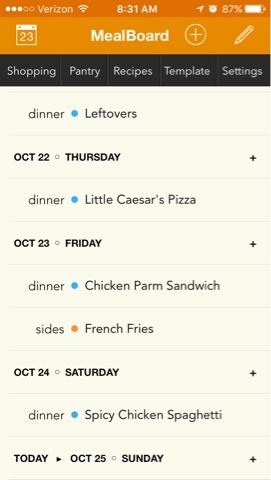 You'll have to get in there and play around - it took me a day to get 6 weeks of previous meals from the wall calendar into the app and get them categorized so they are easy to access. A day well spent I am sure!! I seriously doubt I will use the shopping feature. And I can't see me running an inventory of my pantry. 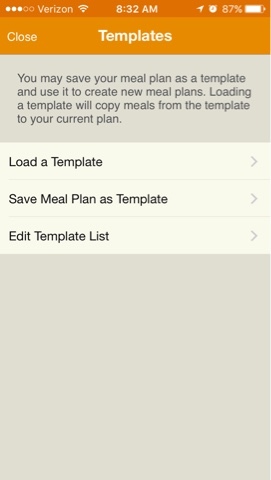 But this meal planning super hero app designer has just made this gal one happy squirrel! !